As part of our education efforts and giving back to the community, we wanted to come up with an interactive way to teach about Rainwater Harvesting. We wanted something fun and easy to transport both for booths and events as well as taking to schools for education. We went through many different ideas and designs, including large and small scale before settling on our final design that is shown below. We even considered a doll house model before deciding that would not really meet all the criteria we wanted to accomplish. With our business centering on Water Conservation, we take a sustainable approach to everything we do. With that in mind, we strive to re-use items when it makes sense. The demo pictured above has the following as new components: Gutter, Corrugated Roof, 100 gallon tank, First Flush Diverter, Water Level Monitor, Pump, PVC and connection hoses. We re-used pallet wood for the base, a metal cart with wheels, paint, and a small piece of plywood for the roof. This small but functional demo illustrates in real time most of what Rainwater Harvesting is about. 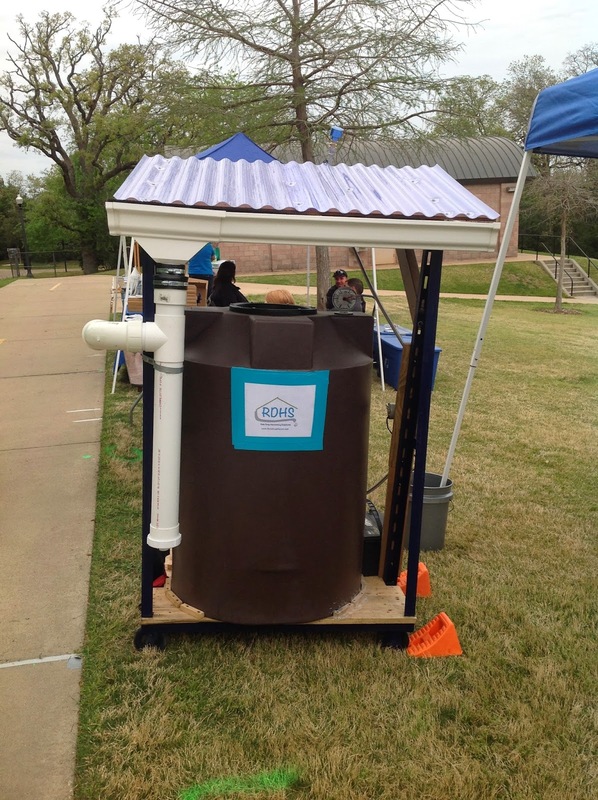 We had a constant stream of people stop to learn more about Rainwater Harvesting and uses for Rainwater in general at our inaugural run at Brazos Valley Earth Day 2014. For demo purposes, we have the water running in a continuous loop out of the tank ‘raining onto the 12 sq ft roof’. The water runs into the gutter and down into the First Flush Diverter and drips slowly illustrating the first flush of water from the roof in a rain event. Once the First Flush Diverter fills up, then the cleaner water from the roof runs into the tank and is harvested for the end use of the property owner. These uses can range from drip irrigation for landscape and garden, to large scale irrigation of plants or lawn, watering of livestock or animals, car washing, and can even be used for drinking water inside the house once the proper filtration and UV light system is installed. This demo is now available for future events as well as education in conjunction with many types of lesson plans at our local schools. We would love to come out and teach your group about Water Conservation, Rainwater Harvesting, the rain cycle and the many uses of Rainwater. All of these topics can be covered concisely or you can choose the one that best fits your lesson plan currently. Contact us today to book your dedicated time on our calendar. As always, comments and questions are welcome below. Categories: Education, First Flush Diverter, Irrigation, Poly Mart, Rainwater Harvesting, Water Conservation | Permalink.